Quarter the cauliflower and remove the core and roughly chop. Add to Vitamix Ascent and fill completely with water. Turn machine on and blend at variable speed 1 for 15 seconds. Pour into colander to drain. Place drained cauliflower in a microwave safe bowl and cover with plastic wrap. Cook for 5-6 minutes or until the cauliflower is just tender. Allow to cool. Once cool - transfer steamed cauliflower to dish towel and ring over the sink to remove as much excess water as possible. Transfer to a large mixing bowl. To the cauliflower, add the almond flour, AP GF flour, and cornstarch - mix to combine. Add eggs, one at a time, mixing to incorporate each one. When eggs are incorporated, add remaining ingredients and mix well. Lay parchment onto the backside of a large rimmed baking sheet. 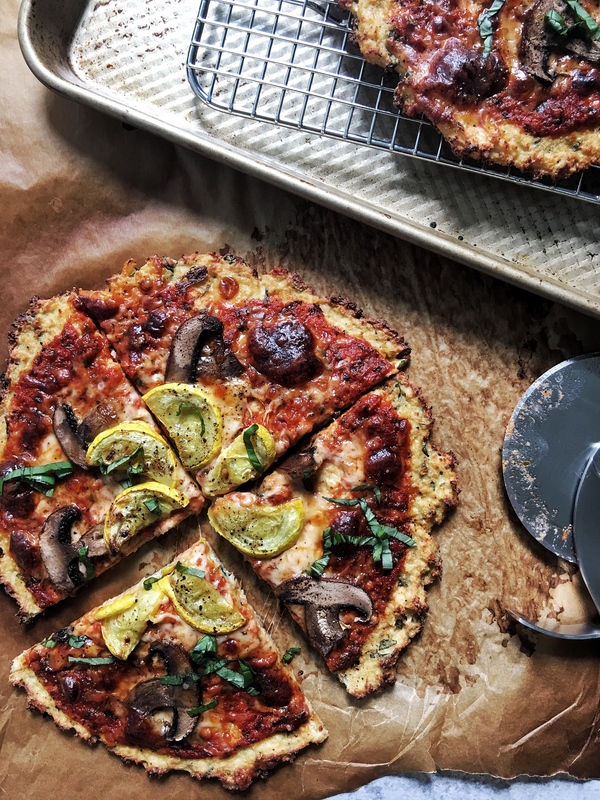 Spread the cauliflower crust into two circles and bake in the oven until golden brown - about 15-20 minutes. Add all ingredients into the Vitamix Ascent and blend on high for 1 minute. Spread ¼ cup sauce on each of the pizzas and top with ¼ cup cheese - divide sliced squash and mushrooms between the two pizzas and sprinkle with ¼ teaspoons salt. Return to oven and bake until the cheese is melted and the crust is deeply golden around the edges. Allow to set for 3-5 minutes before cutting!